Shopping for mobile phones online can be really confusing in a good way. There are several choices available with each having one spec the other doesn’t make it hard to know what to choose. If you’re the type that lives within budget and can’t seem to get the right phone for your budget, here is a list of top Android smartphones within 30k budget. For light users, you can easily perform your daily tasks with ease. Some have as much as 16GB internal storage and 5000mAh of the battery. These are recent phones with amazing prices and nice specs, that can do almost everything for you. For light users, all these phones are perfect for you and won’t slow you down while performing tasks. 1. 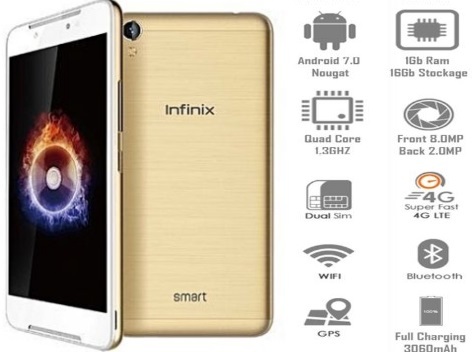 Infinix Smart X5010: Being the first of the Infinix Smart series that is soon to further penetrate the mobile industry, this particular model is worth more than the amount set for it. The Infinix Smart runs on the Android version, 7.0 nougat, accompanied with a quad-core processor, thereby making it fast and efficient when running applications. The battery life of the device is also strong compared to most devices on the same price level, with a 3060mAh non-removable battery. Selfie and Groupie lovers are not left behind, the Infinix smart sports an 8MP rear camera and a 2MP front camera with a dual flash feature giving you that bright and glowing image. Don’t miss this amazing opportunity to own this device at a price of 28,500NGN. 2. 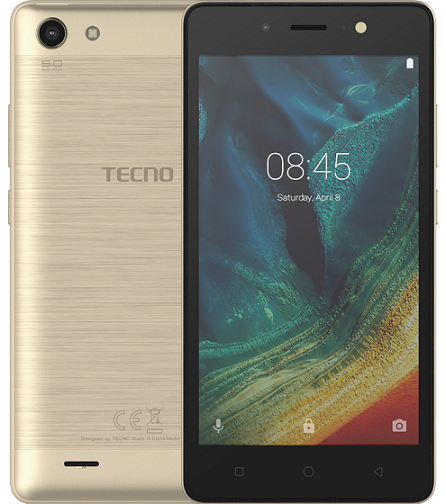 Tecno WX3 P: It will be weird to have a listing of the best android phones under 30,000 Naira without mentioning this phone. This offering from Tecno is even more compelling because it features a massive 5,000 mAh battery. This means the Tecno WX3 P (a.k.a. Tecno WX3 Pro) should deliver very good battery life. It sports a 5-inch display, a 5MP rear camera, and a 5MP front camera. At a price of 26,500 Naira, this looks like a good deal. 3. 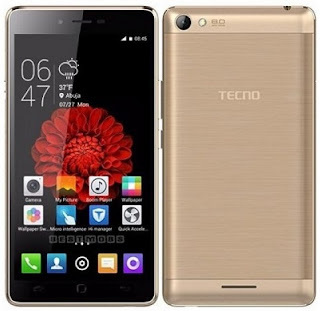 Tecno L8 Lite: One good thing about being a successor to an older model is more specs at a cheaper price – so is the story behind the Tecno L8 lite. 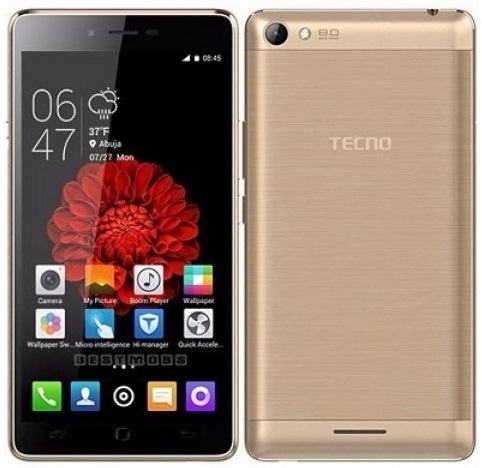 Manufactured by Tecno Mobile, the L8 lite is the successor to the popular L8. With functions and capacity, the L8 lite comes with 4G LTE network speed which allows you to enjoy fast internet on-the-go. With a battery capacity of 4000mAh, you get to enjoy a talk time of 8 hours and standby time of up to 250 hours. The L8 lite comes with a 1GB ram and a 1.3GHz quad-core processor speed, making it reliable and fast when handling processes or apps. It also comes with an internal memory of 16GB and supports external memory card up to 32GB. It runs on Android version 6.0 – marshmallow. Price 29,280NGN. 4. Samsung Galaxy J1 Prime Mini: Wondering if there was ever going to be a Samsung brand worth below N30,000? Well, there is and it’s an affordable one! 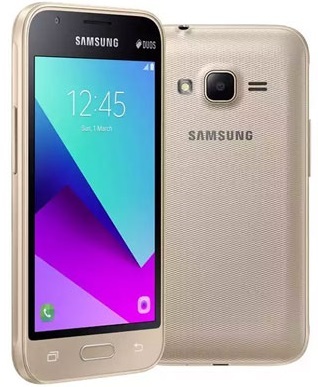 Announced in December 2016, the Samsung J1 prime mini still has the necessary specs to compete with brand new phones. With a storage memory of 8GB and expandable memory of up to 256GB, the J1 prime mini is all you need to store an endless list of songs, movies, pictures and more. It runs on the Android 6.0 marshmallow version and comes with a 4G LTE network for fast browsing. It also comes with a 5MP rear camera and a VGA front camera. Price 23,000NGN. 5. Leagoo KIICAA Power: It comes with a 5.0-inch screen with a resolution of 1280 x 720. At the top of that screen is a 5MP camera that works in tandem with the 8MP unit on the back to bring you a good image and video shooting experience. To cap it all off, the unit offers a fingerprint sensor. All of these will go on to be supported by the rather large 4000mAh battery. At the price of 27,000NGN. 6. 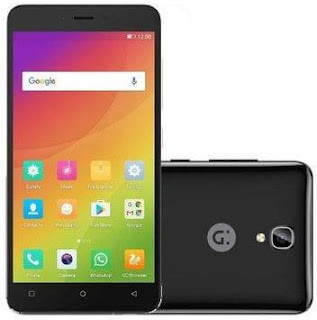 Gionee P8W: Being the successor to the Gionee P5W, the P8W comes with a 4G LTE network, making it super fast when streaming online videos or using the internet. The Gionee P8W is affordable and is a lot better compared to its predecessor. It comes with a 1GB ram for smooth running of apps and multitasking accompanied by 1.3GHz quad-core processor. That’s not all, it boasts an internal storage memory of 16GB which is expandable to 128GB. With both front and rear cameras having LED flash feature, it has a 5MP and 8MP camera spec respectively. It runs on the Android 6.0 marshmallow version. It comes with a battery capacity of 2300mAh with a fast charge feature. At the price of 29,000NGN. 7. Oukitel U20: This amazing Smartphone comes with amazing features while remaining really affordable. Its fingerprint sensor provides more security to your files and documents. 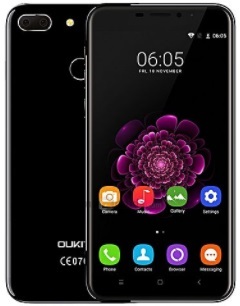 The Oukitel U20 comes with a 2GB ram, with a 1.5GHz quad-core processor, making it super fast and freeze-free when multitasking or running apps and programs. With an internal memory of 16GB expandable to 32GB. If you love taking endless selfies then this is the perfect device for you. With a 13MP + O.3MP dual rear camera and 5MP front camera, taking pictures in HD just got better at the price of 22,420NGN. 8. 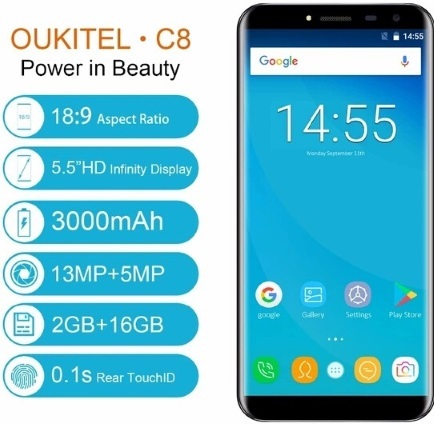 Ouikitel C8: The Oukitel C8 is another smartphone with everything in place that makes up a budget device. This phone has the camera, the battery and also a RAM to boost the performance. There is rear-mounted fingerprint scanner which makes everything even more interesting. Users will be getting this phone in a full-screen display of 5.5-inch 620 x 1280 pixel with 260 ppi density. The 5.5-inch smartphone ships with Android 7.0 Nougat out of the box, carries support for dual SIMs and is reasonably light, tipping the scales at less than 0.35 grams. The 3000mAh battery on the Ouikitel C8 will be able to support the 2GB RAM and quad-core CPU that can clock up to 1.3GHz. It would be wrong to talk about this unit and fail to mention a 13MP camera sensor on the back, as well as the selfie-shooting 5MP camera. On board are fingerprint sensors, support for 3G networks. If you want a sizable battery, the Oukitel C8 is one of your choices for Android phones at the price of 28,000NGN. 9. 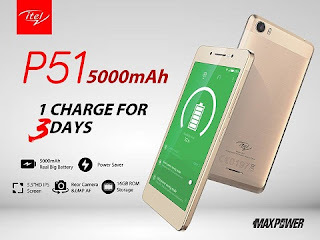 Itel P51: Looking for a mobile phone that offers you a long lasting battery life as well as efficiency when running programs and apps, you should go for Maxpower. The Itel P51, known as “Maxpower” gives you a whopping 5,000mAh battery life. With a 1.3GHz quad-core processor and 1GB ram memory, the max power is specifically designed to meet every need of a smartphone. It comes with an HD camera of 8MP rear camera with dual flash and a front camera of 2MP with a soft flash. Running on Android version 7.0 nougat, the Itel p51 comes with an internal storage memory of 16GB which is expandable to 32GB. Price 29,000NGN. 10. 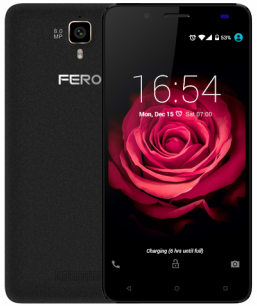 Fero Zoom: Fero Zoom is an Android smartphone manufactured by Fero Mobile. 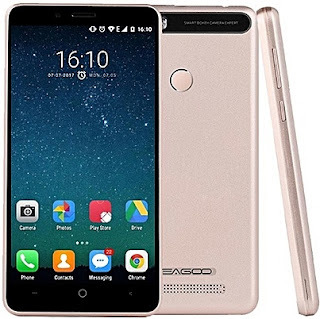 It is a 4G LTE phone that runs on android 6.0 marshmallow version. With a 1.3GHz processor speed and 1GB ram, it runs smoothly and efficiently when running apps and programs. It also comes with an internal memory of 8GB and can use an external memory of up to 32GB. Fero zoom comes with a battery capacity of 2100mAh removable battery. ‘Selfies’ and ‘groupies’ lovers can relate with an 8MP and 2MP rear and front camera respectively. Price 26,900NGN.